An Irish startup has designed and created a range of colourful sustainable rash vests manufactured from 100pc recycled ocean waste. Founded by three friends with a passion for watersports, Rash'R wanted to bring to market something for similar enthusiasts while contributing to a cleaner ocean. 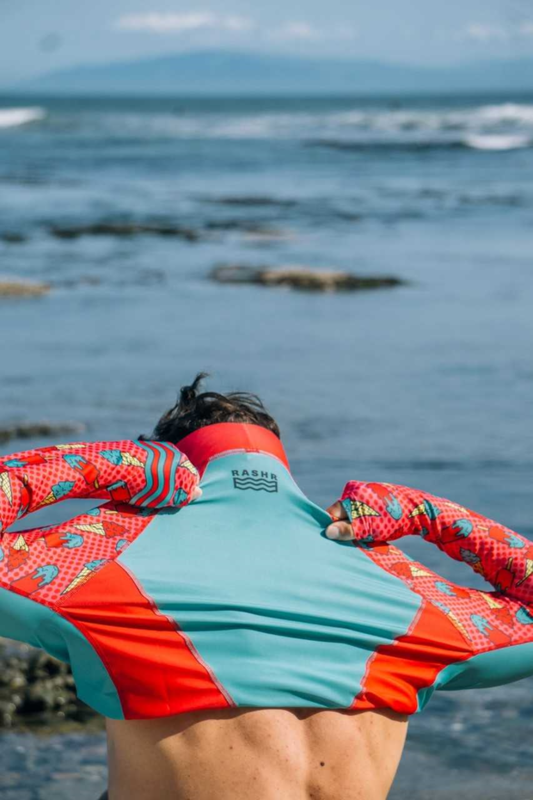 Each of the rash guards are created with high performance, sustainable techno-fabric made of 100pc recycled polyester which comes from waste, including fishing nets, carpets and other waste collected from the sea. CEO Tom Cotter said that the idea first came about when himself, Alex Musgrave and John Downey went for lunch after a morning on the water in July 2015. "We were sick of seeing grey, black and white and thought that we'd love to see a bit more colour. So we had a pizza and look a look," he told Independent.ie. "A lot of other sports had colourfully designed products, from cycling to golf, but the more we looked, colour in rash vests was a niche that was lacking and the big brands weren't really following". 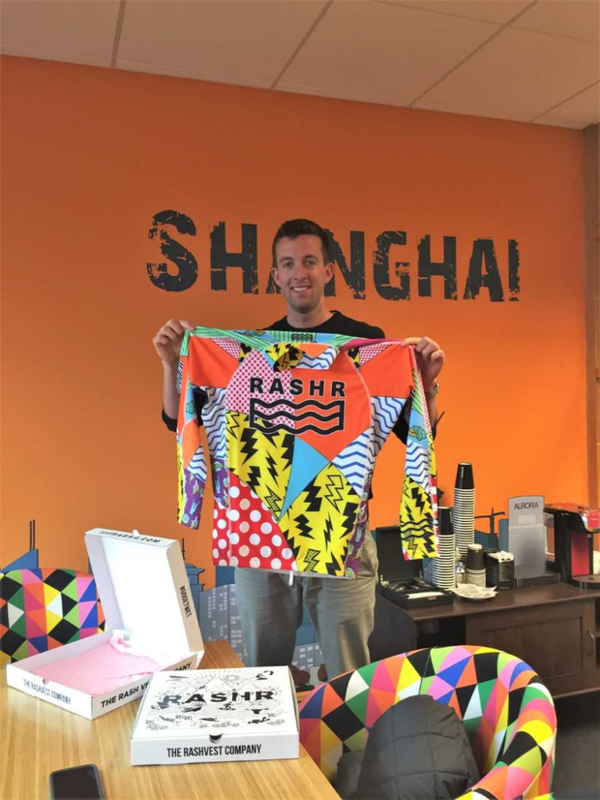 Memories of that early pizza conference are marked in the packaging of the Rash'R vests - they are actually delivered in pizza boxes - but it would take longer than originally expected to make the concept a reality. "In our heads, the product development stage would take around three months but fast forward to 18 months later, we had created our first prototype. We really struggled finding fabric manufacturers, clothing manufacturers and printing companies that could suit our needs. "Sustainability kept coming back to us, throughout the various trade shows and research months, and this was something that was really important to us." 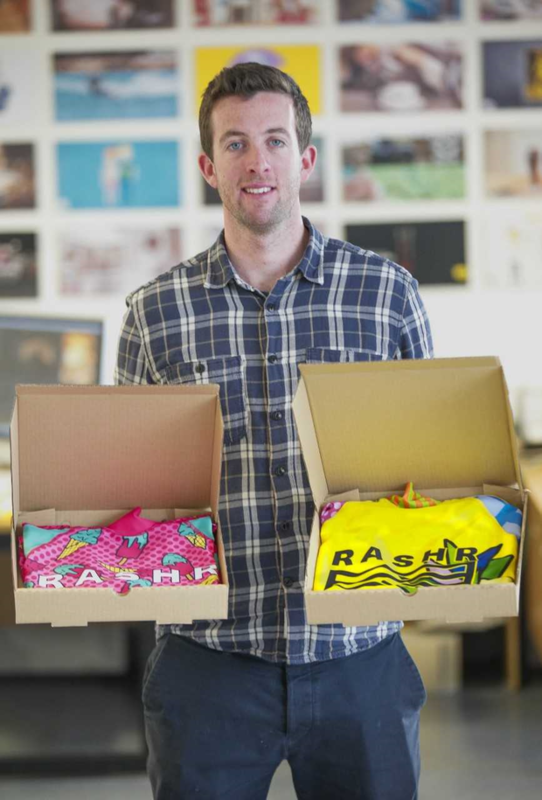 It would be over two years after the co-founders initial chat that the Rash'R website and its products would go live, in October 2017, selling out of 99pc of its stock within two months. "The most frustrating thing for us is that we kept missing peak seasons; and when we finally launched after buying a ton of stock, we sold out everything within two months. "But then the problem was that we had we only developed a long sleeve mens vest as a taster products, six versions of it, and all our money had gone into marketing. And we had no cash left." It was a steep learning curve for three entrepreneurs who had several years of experience in business, but not with products. Tom was involved in the business end of the outdoor and recreation industry for more than a decade, Alex founded Irish digital media company Dog Day Media in 2011 while John is the founder of Irish restaurant chain Ramen. But, at that point with Rash'R, "it was walk away time". "Then I went in for an interview with a company a startup and explained what I had done over the last two years. The investor was on the board and said if I came on as a consultant for six months, he would invest in Rash'R." Rash'R launched again in August 2018 with full ranges for mens, womens, children and toddlers and a new website; their products available in retail stores and online, shipping to 24 different countries. Today, a team of six remote workers span eight countries including Ireland, the UK, the US, Italy, Spain, Vietnam, China, and Australia. The products have also gained interest from some of the world's top water sport athletes. "Because we have the sustainable fabric, another big avenue for us is custom clothing for theme event competitions - and for eco friendly resorts," said Tom. "The fact that the products are 100pc eco friendly, and can be printed with any logo or team name, makes it very popular." Rash'R is expecting to expand its product range with jackets, t-shirts and hats that are all at least 64pc eco-friendly by June 2019. Louise Kelly At the age of 25, Paul Kenny founded online coupon website, Cobone. It was later sold in a multimillion-euro deal to the US-based investment firm Tiger Global Management.